Join It's Time for Texas to kick off the healthiest week of the year. 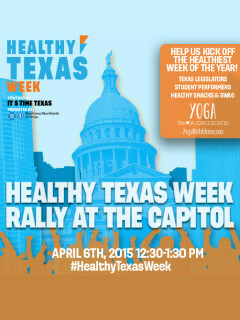 There will be speeches from Texas legislators, yoga with Adriene Mischler (Yoga With Adriene on YouTube), healthy giveaways, a healthy snack demo and a group walk around the Capitol to demonstrate our support for policies that protect and further the health of Texans. For more information about Healthy Texas week, visit the website.